As i wrote in an earlier post, the best way to realize a multilanguage application is to get translated text from a database. 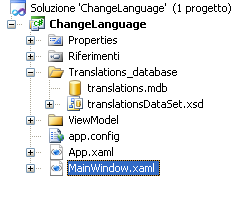 I think that one of the best database to use for translations is MS Access, because every translator has an office suite installed on his PC, and for him makes no difference translate on Excel or Access, but if you ask him to translate your sentences on “a random SQL data viewer”, it can be a pain. The reference to the culture is contained inside Settings, and that’s where i modify my language preferences, so when i load the program i know automatically what language i should use. – The application should change not only the texts, but also date/time format, right to left writing and so on. 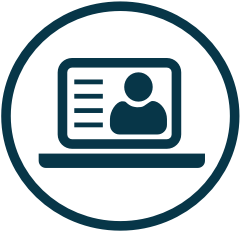 3#: Add the current culture field on “Settings”: this field will be used on all the project to set the national preferences. 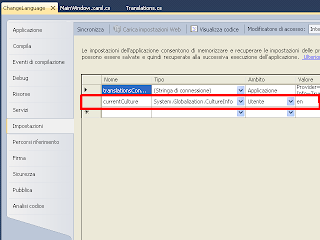 4#: Customize the translation class modifying the namespace and the table rererences, if you modified them. You can see that it’s really simple to extract translation with this method, it’s just needed that you pass the name of the control to the method GetString to receice the translated Content. The sample code described herein is provided on an “as is” basis, without warranty of any kind, to the fullest extent permitted by law. Great post! I’d like to point out that instead of implementing your own database for localization, WPF provides its own service in the form of resource files. Here’s the definitive Microsoft Guide to WPF Globalization and Localization. Even if you’re not sure if you want to provide localization in the future, it’s good practice to store your literal strings in .resx files anyway. That way, adding localization in the future shouldn’t affect your code. I got used to translations like in WinCC, where you had a table with all languages, so i thought this was the best way for external translators to translate an application. I’ll try the resx method for sure. Congratulations for your awesome blog, i always check it and it’s a mine of knowledge !!! You are doing an excellent job sharing such knowledge with us ! In solution Explorer, right click on the project, then properties. In the window that opens, there you find a tab with settings. But you probably better check google for c# settings to understand better. You can click browse on the bottom of the list of types, then expand mscorlib and there you find system.globalization.cultureInfo. Hope it’s correct because at the moment I don’t have visual studio here. that’s the point , i cannot find even in browse. Maybe something should be add in project resources ??? After you click browse,you can try to type System.Globalization.CultureInfo directly in the text and press ok, without expanding anything. If this doesn’t work I should check visual studio but will be next week. Also you should check if you are using .Net 4.0. I don’t know about earlier versions of the framework. You have to try to guess yourself. When I’ll be home I’ll try to download the example and check what’s wrong. This will be next week.